After booting the wan acceleration appliance from USB, by default the datastore will be mounted on the boot partition. For the best performance the datastore can be mounted on a solid state drive. The .img raw image file can be written directly to the destination drive as per the USB Start Guide. When SCSI drives are used, it is recommended to boot from flash and mount the datastore on the SCSI or RAID devices. 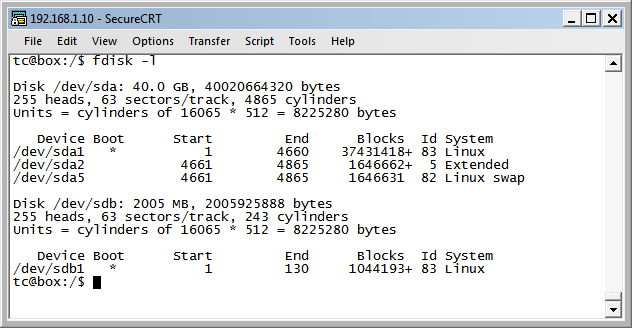 In the following output there are two drives. The first drive is a 40GB physical drive and the second is a 2GB USB flash drive. Set the datastore drive in the GUI. Verify via the system overview tab that the datastore is mounted on the correct drive. When writing the raw image to HDD, the free space on the physical disk can be used by adding a new partition via the ‘/etc/wanos/wanos-fdisk’ utility. 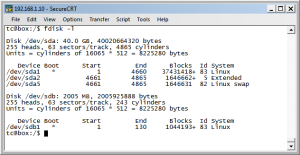 Alternatively the default partition can be expanded with a tool like the GParted live ISO/CD.